Every three years, the NSF LTER Network gathers at the All Scientists’ Meeting, where we share progress, ideas, and best practices from across the Network and beyond. Registration is open to all and may be especially valuable to researchers from coordinating networks and individual researchers interested in working with LTER data or on LTER sites and experiments. The theme of the 2018 meeting is Next Generation Synthesis: Successes and Strategies, and will take place from October 1-4 at Asilomar Conference Grounds in Pacific Grove, California. The workshop schedule is now available on the popular meeting scheduling app, Sched. Attendees are encouraged to create and save a personal meeting schedule in the app. A diverse array of workshops are available in all time slots, but some will be more popular. Special day-long communications trainings are now completely full. Meeting Facility: Asilomar Conference Grounds offers cozy lodges and cottages nestled in 107 beachside acres in the charming town of Pacific Grove, California. The LTER has reserved the entire venue. All rooms at Asilomar are now filled. You will need to find accommodations nearby AND register for the conference and meals at Asilomar under off-site registration. There is an absolute cap on the total number of people who can attend the meeting and we are getting very close. Vacations Center Monterey does consolidated reservations for the area. You can reach them at 831-612-7317 or 800-466-6283. If you are looking for a shared room, or a roommate, visit the google sheet here to post your information. General Registration is now closed. Please contact Marty Downs, downs@nceas.ucsb.edu, if you have a concern. Lodging, food, and conference costs are included in participant registration of $202.50 per night, shared occupancy. Single rooms are by specific request and are charged an additional cost of $95.35 per night. Staying at an area hotel, rather than on-site at Asilomar? You MUST register here for the meeting and any meals you intend to eat at Asilomar. Please register and purchase meal tickets for each day you will attend the meeting. Outside food is not allowed on the property. General Meeting includes morning plenaries, submitted workshops, invited workshops, evening poster sessions and special events. The last session of the day on Tuesday afternoon is unscheduled to allow for ad hoc group meetings. Most participants depart after breakfast. Checkout time is 11:00 am. MCM Site meeting stay on. The ASM Planning Committee has been working all year to identify speakers and workshops who will address the impact, challenges, and tools of synthetic science; highlight current accomplishments; and chart a path for future endeavors. 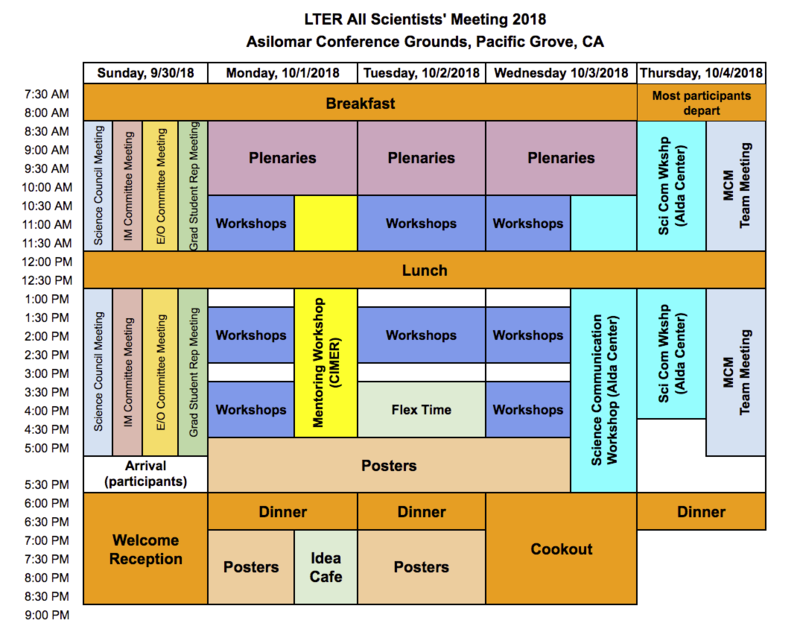 Our goal is for the Long-Term Ecological Research Network (LTER) All-Scientists’ Meeting to be a place of connection, renewal, and intellectual ferment. As long-term researchers, we value persistent attention to what often goes unseen and unrecognized: slow cycles, legacies, the role of rare events. We steward our data and methods with care, because only a community of researchers has a chance of revealing the complex whole. Our work is a marathon, not a sprint, and we take this time to appreciate our fellow marathoners. The All Scientists’ Meeting is a place to share your insights and successes and to find companions and collaborations for the next leg of the journey. The meeting will provide several opportunities designed to facilitate these interactions, including social events and plenary lectures by inspiring speakers. The core of this meeting however, comes from you—the community—in the form of contributed sessions. Workshop and poster submissions are now closed and the workshop schedule is available.